Teen Reach Adventure Camp Cook Off! You are invited to come and experience a SOUPer Bowl Cook-Off and Silent Auction. 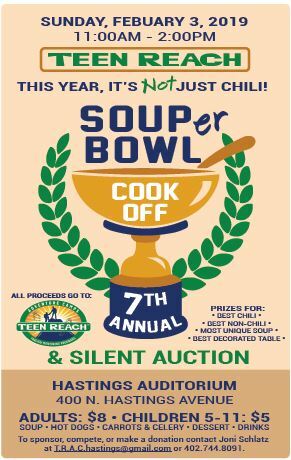 Teen Reach Adventure Camp – Hastings is sponsoring a 7th Annual Soup Cook-Off (Formerly known as the Chili Cook-Off) – Fundraiser. All you can eat soup and cinnamon rolls, Silent Auction, and Door Prizes. All proceeds go to summer camps for children in foster care ages 11 – 15.